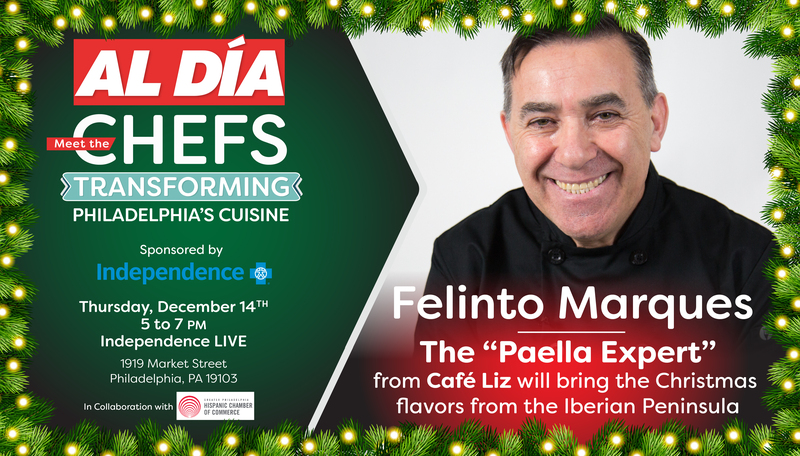 Join us for an exciting and one-of-a-kind live cooking event with Felinto Marques of Café Liz, where he and his team of accomplished cooks will demonstrate recipes that are dripping in Portuguese pride, nostalgia, and ajillo to kick off the holidays! The owner of one of the City’s secret jewels, a humble two-story hideaway on 5437 N. Lawrence Street, Filinto expresses his prime paella expertise, wine pairing skills, and bacalao fanaticism through his dishes. Though the space is simplistic, the service, attention to detail, and cuisine are nothing short of outstanding. Every plate is prepared thoroughly, ensuring that every bite comes with a bursting sensation of being on a culinary adventure to the portuguese mountainsides bordering Galicia. The holidays are best celebrated with hearty food, merry cheer, and jolly company! Share the gift of a great night out with a friend! AL DÍA News is proud to partner with Independence Blue Cross to present a series of cooking demonstrations by Philadelphia’s established and aspiring Latino chefs.